Tracing back to the ancient Aztecs, the celebration of Dia de Muertos falls on November 1st and 2nd each year as a day to remember and honor the departed loved ones in your life. 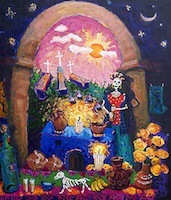 A national holiday in Mexico, but celebrated around the world, the Day of the Dead is a time to decorate small alters, clean and beautify grave sites and to gather with friends and family to reminisce and tell stories about those who have died. Favorite food and beverages, treasured belongings, freshly baked bread and candied sugar skulls are all a part of the fiesta, but one of the most important decorations are the marigold flowers. Said to be the favored flower of the dead, the Mexican marigold (Tagetes erecta), sometimes called cempasuchil or Flor de Muerto, is an essential part of the traditional celebration. Native to Mexico and parts of Central America, the marigold is a member of the sunflower family and loves hot, sunny days. It is grown as an annual bedding plant in temperate climates and many gardeners plant it around their vegetable garden, as it is said to ward off pests. In tropical climates, it grows as a perennial and can grow to a foot for more in height. It thrives on neglect and can tolerate both drought and over watering, making it very adaptable to most climates. The leaves of the marigold are a deep green and fern-like in shape, releasing a sharp tarragon-like scent when crushed. They are often substituted for tarragon in recipes and all parts of the flower are edible. For centuries, this plant has been used in traditional folk medicine by pre-Columbian people and modern day testing has found that some of the active chemical extracts inhibit the growth of bacteria in lab studies. Both leaves and flower parts can be brewed into a tea and the deep saffron color of the petals have been used as a natural dye. While the petals of the flower can come in a variety of shades of yellow, orange and golds, the color most popularly used for Dia de Muertos is orange. The whole flower heads can be strung together to form a garland or used to decorate the small alters and petals are plucked and sprinkled around graves and tombs. Along with beautifying the surroundings, the marigold is said to attract the dead back to their graves to visit with the family and enjoy the offerings.